Betta fish are awesome, with their vivid colors and glorious fins they deserve a home that allows them to flourish and live a healthy life. In this article, you’ll be walked through a simple 3-step guide to setting up the ideal environment for your Betta. Picking Your Betta's Tank: Size Matters! Unfortunately, it’s common to see betta’s housed in tiny plastic bowls. The reality is, this results in betta’s becoming sick and living a poor life. Just because betta’s come from shallow streams doesn’t mean they can be kept in tiny bowls or tanks. But, that’s not you, you want to own a happy and healthy betta – you want it to thrive. Your chosen tank should be no-less than 5 gallon – the BIGGER the better. And 5 gallon tanks are the lowest volume of water needed to easily establish the Nitrogen Cycle. Yes, it’s possible in smaller tanks, but it’s a long and infuriating process. If you’re still looking for a suitable tank, check out this post for our recommendations. Even though bettas come from still waters, you must use a filter. A filter will help keep your tank clean and reduce the amount of harmful bacteria which can lead to disease. You can see our guide and reviews for Betta fish filters. Pro Tip: To get the best filtration for your tank, use a filter with a GPH 4 times greater than the size of your tank. GPH stands for gallons per hour, and it’s how much water it will filter every hour. Example, a 5 gallon tank would be a filter with at least 20 GPH. Yes, you’ll need to buy a heater because Bettas come from the tropical waters of Thailand. You should buy a fully submersible heater which can keep the temperature between 78-80 degrees Fahrenheit. And you need to be able to easily monitor the temperature. If the temperature drops too low, you open the door up to diseases such as Ich. Too high, and you’ll speed up your Betta’s ageing process. Choose a heater that comes with a thermostat so it’s easy to monitor. And always use a separate thermometer, the readouts from heaters aren’t always accurate. Never put a heater on a tank under 5 gallons. 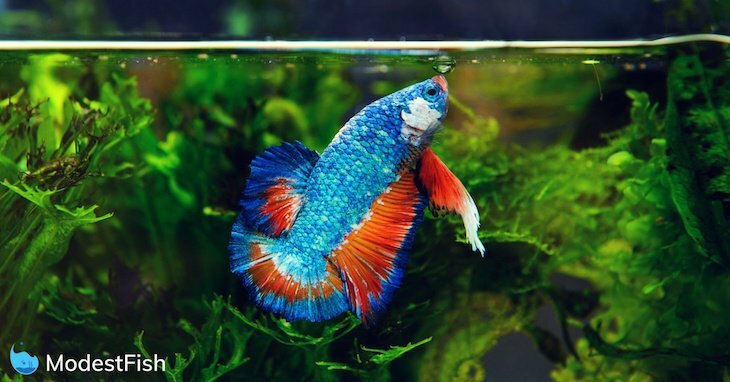 It can be dangerous to your betta’s health, due to the water temperature warming and cooling too fast. But that shouldn’t matter… you’re not going to keep your awesome betta in a tank under 5 gallons, are you? 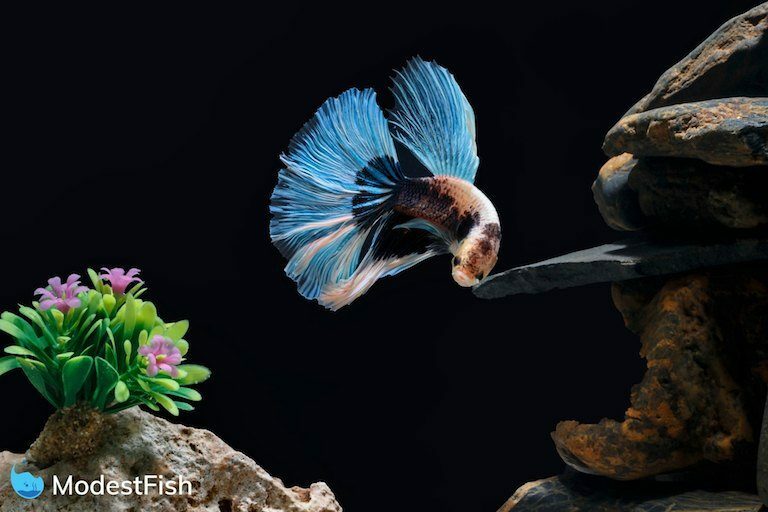 Betta’s love to swim at all levels, and it’s common you’ll see your betta cruising along the bottom. You’ll need to buy small or smooth gravel so your betta doesn’t hurt itself. Your gravel will also play an important role in your tank ecosystem. Benefical bacteria will grow on the surface, helping to break down waste. If you buy gravel made with large pieces of rock, food and waste can get stuck among them and hurt the health of your tank. Pro Tip: If you’re using live plants, you’ll need two inches of gravel to ensure they root. Fake plants (silk only), you’ll only need one inch. Betta originate from Thailand, inhabiting rice paddies, slow-moving streams, and large puddles – all shady places with plenty of hiding sports. Your Betta will love swimming in a tank which contains caves to hide in and plants that provide plenty shady areas. Betta’s enjoy lounging on leaves and have comfortable places to hide and sleep. It’s important you check ornaments for spots that could snag or tear your Bettas delicate fins. And if you’re going to use fake plants, don’t use plastic ones, use silk plants. Live plants are always good because they’ll help clean the water and provide your Betta with a natural environment. You can read our complete guide to Betta fish plants here. Pro Tip: Your Betta can become bored and depressed easily. It’s a good idea to rearrange the decor when you clean the tank. This will help keep things interesting for your Betta. Your Betta fish is just like you when it comes to lighting. It prefers a schedule: wake up when it’s light, go to sleep when it’s dark. If your chosen aquarium doesn’t come with its own lighting, I recommend buying one. 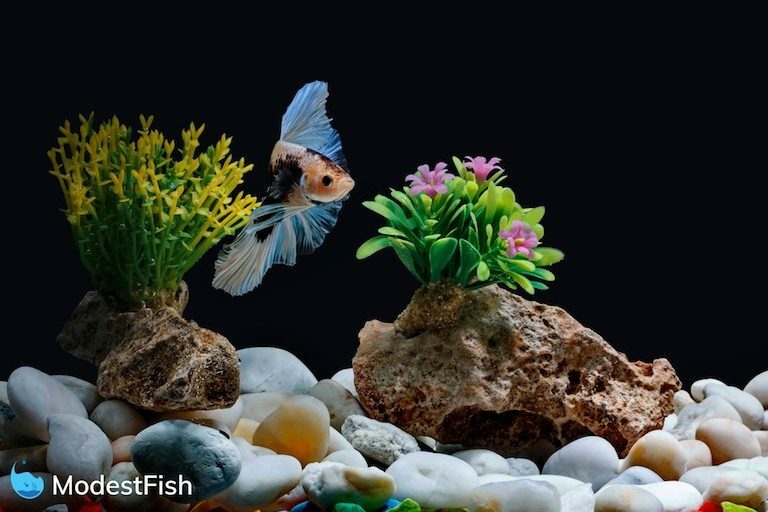 You’ll be able to provide your Betta with a regular schedule it needs to stay healthy. LED lights work best because you can control the light intensity. And some will come with automatic timers so you don’t even have to think about it. Start by cleaning out your tank with just water, no soap! Then choose a sport that’s near a window, but not exposed to direct sunlight. Make sure the surface is nice a sturdy – you may want to consider purchasing a stand designed to hole the weight of your tank. Leave five inches between the aquarium and the wall to allow for the filter. If you have other pets, you may want to consider placing your Betta in a room they don’t have access to. Not all filters are the same, so different types will require different installation methods. It’s very common that the instructions on filters are terrible. I’d actually recommend using Youtube to find clear tutorials on how to setup your filter. Make sure you don’t turn your filter on until your tank is filled with water. Give your gravel a thorough rinse with cool running water to remove dust which could clog your filter. Don’t use soap. Then add your gravel to the tank. Remember, if you’re using real plants, you’ll need at two inches of gravel. For silk plants, one inch will be enough. Ensure the roots of your plants are properly buried in the gravel. And all your decorations are anchored in the gravel, so they won’t come loose. Pro Tip: To get the best views of your Betta, arrange your plants so the taller ones are at the back of your tank. Place a plate on top of your gravel, and pour water on top of the plate to fill your tank. Using a plate with prevent you from displacing the gravel. During this process you’ll want to check for leaks. Don’t fill your tank all the way up, leave about an inch and the top. Your Betta’s an anabantoid, meaning it’s able to breathe the same air as you and me by using a unique organ called a labyrinth. Cool, right? If your Betta is unable to use its labyrinth from time to time, it can be very bad for it’s health. That’s why you leave a gap. Your Betta is also a surprisingly good jumper, so filling your tank to the brim is risky. Pro Tip: Remember to remove the plate after you’ve finished! Now that you’ve filled your tank with water, it’s safe to turn on your filter. Make sure the water is circulating gently, soothly, and quietly. You may need to adjust the settings (that’s why is good to buy an adjustable one). It’s common your heater will come with suction cups to attach it inside your aquarium. Following the instructions, you’ll want to set to temperature so it’s between 78 and 80 degrees Fahrenheit. Place your thermometer so you can easily monitor the temperature. If you’ve filled your tank with tap water, it’ll contain chlorine. So add some neutralizer (follow the products instructions), to remove the chlorine. This is important because chlorine will stop you from being able to perform the most important step – the fishless cycle. If you don’t do this, when you add your Betta it will die. A fishless cycle is a humane method of the Nitrogen Cycle. Beneficial bacteria will become established in your tank and filter media. Allowing ammonia (toxic) to convert to nitrite (toxic), then nitrite to nitrates (non-toxic). That’s why you can’t skip this step. 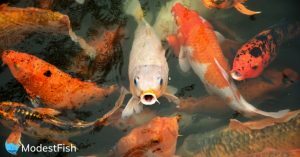 The beneficial bacteria will supplement your fish’s environment by neutralizing their waste. For an easy-to-follow guide on how to cycle your tank, read this guide. Don’t buy your Betta until your tank have finished cycling. It will just make the whole transition smoother. When your tank is ready, it’s time to go buy your Betta! Don’t go plopping your new Betta into your tank. It will stress your fish and is likely to end in tears. You need to acclimatize it to its new environment. Your Betta is going to come in a bag of it’s own water, which is going to be different from the water in your tank. Keeping the bag closed, float it in your aquarium until the water in the bag reaches the same temperature as your tank. This can take around one hour, so be patient. Once the water in your Betta’s bag reaches the same temperature in your aquarium, begin to add small amounts of your tank water into it’s container. When the majority of the water is from your tank, let your fish swim freely into the tank. Betta fish are fantastic pets and they deserve to be treated right. After going through the correct method of preparing its tank, make sure you care for it properly. This means, feeding it Betta approve food once a day, being careful not to over feed it. Perform 20% water changes once a week to maintain a healthy environment. Monitor your the pH, ammonia, and nitrate levels, correcting any issues. And clean your tank regularly. If you’re using a filter, you’ll need to do this once every few weeks. 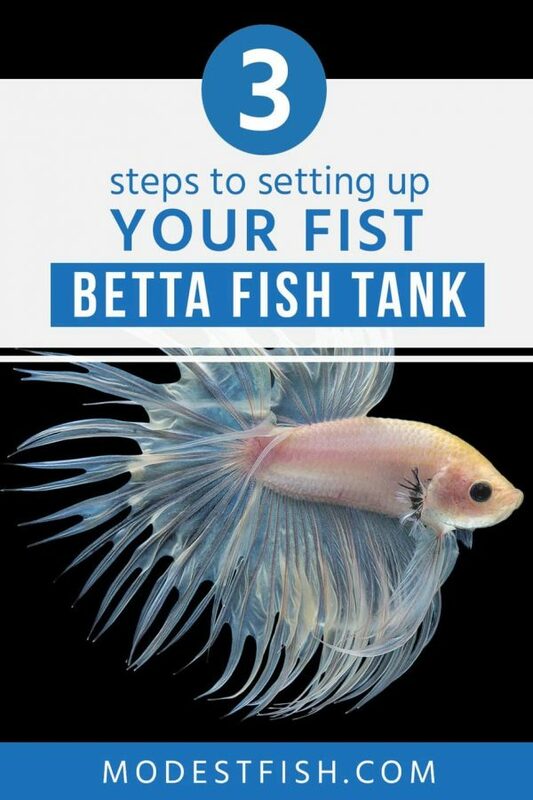 Follow this guide, and you’ll have a vibrant happy Betta as a friend for years! Leave a comment, let me know about your Betta tank or if you have any questions or suggestions. Thank you for your comment. Yes, my advice would be to bag him with his old water and introduce him gradually to the new environment. Happy fish keeping! So, i rescued our betta, Frederick from a gas station. Was in a bowl that was the size of a half a quart. And water had dehydrated bad, so not much water. He looked terrible. Guy finally sold me him for a quarter but told me not to expect him to live. He was waiting for it to die to flush him.. His fins where ragged. He just layed there. I knew a good tank could help him out if he didnt die. I have a 10 gallon i keep for quarantine, fry and live plants. So tank was ready for him. He still looked awful a week later, but he perked up and was active.. 3 months later, now he is gorgeous! Beautiful fins. I do a 20% water change once a week. I have a soap dish catching filter water to slow current down. So, im no weird animal lover, i just think this fish has some royal Caribbean coming.. is he fine being alone or is there other fish he will get along with? 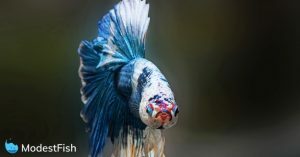 I know he will fight another male betta, but what about other types of fish? I have had some say this fish or that fish is fine.. told females only will be fine in the tank with him, then no, they are not. Which is it? Can Frederick have some buddies, or is he simply happy being a loner? Thank you for your comment, Leslie. That’s a really nice thing you’ve done for Frederick. But, you don’t have to worry, he’s perfectly happy living alone. In fact, they tend to prefer it. However, depending on the personality you might be able to house it with a friend. 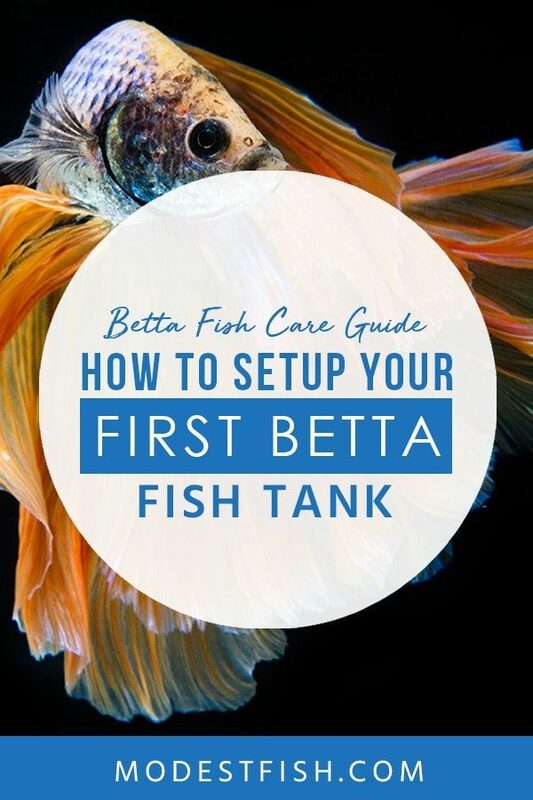 You can check out more information here: https://modestfish.com/best-betta-tank-mates/ But there are no guarantees. Often I would advise not to house anything with a Betta because I can’t be 100% confident in my answer. Sometimes it works, sometimes it doesn’t. Thanks so much for the response. I’ll let him be a bachelor and live alone. Thanks for the information. So much mixed info out there for betas. Gets confusing. Yeah, I’ve only been able to house my Female better with other fish, Neons and Glow Fish. They all got along just fine but she may have had a more calm tempment. Thank you for your comment, Kaylee. That’s great to hear :D. Yes, female bettas tend to have better temperaments than males because it’s males who compete for the female (the females hold all the power). But as usual with Bettas, it’s always hard to know how they’ll take to others. I’m saving a betta thats been in a tiny, filthy, plant vase at my office for a year! They don’t feed it everyday, and its left alone on weekends. I finally got the person to give me the fish and I want to get it into a 5 gallon tank ASAP. I’m worried it might die before I can cycle the tank. Do you have any tips on how to keep it comfortable in its vase while i wait for the cycle to be complete? i don’t want to shock it. Hello Michale, thank you for your comment. Oh my, that’s a situation. I would say keep a very close eye on the Betta, keep doing water changes, give it some plants to rest on, and just try to keep the conditions as stable as possible. Try to avoid overfeeding because you’ll risk ammonia spikes. Is the Betta in bad condition? If so, a epsom salt bath will do it some good. If the Betta has survived for a year in worse conditions, it sounds like a champ, hopefully it will be able to make it through the last bit before you introduce it to paradise. You can check out our article on The Nitrogen Cycle if you’d like: https://modestfish.com/how-to-cycle-your-aquarium/ there are some great tips in there for speeding up the process–might be you best option. I’ve never owned a beta before, so I’m trying to do as much research as I can before I actually get one. 2 questions: When it comes to heaters, which is better, one that fits on the tank or one that fits on the bottom? I found one heater that fits on the bottom of the tank that you can cover with gravel. That seemed like a good way to do it, but your recommendation is one closest to the filter. And my second question is tank size. I live in a one-room apartment. I honestly don’t really have a space for a 5 gallon aquarium. Would a 2. 5 or 3 gallon tank be sufficient? 1. I would recommend having your heater installed by the filter because it will help distribute the heat evenly throughout your tank. 2. Look, Betta’s can survive in a 2.5/3gallon tank. However, I don’t recommend it because I’ve read the studies and it does have a negative impact on the fish’s health. You may also have issues other because when you own a smaller tank, any sudden changes (like your heater malfunctioning) will have a much greater and faster effect on your tank’s ecosystem. Have you had a look at the Fluval 5 gallons? They have a pretty small footprint, so you can fit them into tighter spaces. Here’s the Fluval Chi II and the Fluval Edge. I wish you all the best. Happy fishkeeping. Thanks so much for responding! I haven’t, but I will look into both aquariums. I definitely want happy fish! I have a betta in a 10 gallon with a filter, heater and lighted cover. I put live plants, a castle, dragon and moss ball and he loves it all. At first he was upset and even puffed at me and would hide near the pump but now he swims through the castle and dragon’s mouth, looking at me like look mom! I’m having fun. Today I introduced 2 albino Cory fish and he seems happy with them! Thank you for the tip about the heater near the pump filter! I’m still learning and talking to knowledgeable people. Most people in the pet stores don’t have any idea! Hey, tank you for taking the time to comment. Awesome, super happy to hear you’re enjoying the hobby and you found my site useful! I’m sure you’ll be 10 tanks deep soon. Unfortunately this most pet stores, this is the case. No point getting mad at the workers though, they’re likely just trying to make ends meat and probably don’t get the proper training needed. I always recommend taking anything they say with a pinch of salt, politely accept their advice. Then go home, ignore their advice and do your own research :D. If you have anymore questions or have any thoughts on information you’d like me to write about, feel free to let me know!! Happy fish keeping! People at petstores usually don’t know what they are talking about. I watched an employee tell a mom that two male bettas can stay in a bowl together. The mom then bought one bowl and two bettas. I was going to say something but I decided not to because people get angry where I live and I didnt want to start anything. Ive seen the same with goldfish too that they can live in bowls which is a lie goldfish can get to the size of the bowl, ive even heard someone even say that a saltwater fish can be paired with freshwater fish. Hi my sister is going to get a Betta fish soon and wants to know what supplies she needs in order to help it stay alive and live a happy life! She has a 10 gallon tank she will put him in and that’s about it. Do you have any recommendations on what filter, heater and light she should get? Also this article was really helpful! Thanks so much!! Hey Ken, thank you for your comment. Your sister is definitely on the right path with the 10 gallon! For a light, go with LEDs. Cost more upfront, but you save a lot on you electric in the future. For your filter, I think a HOB filter would be great for a Betta tank. For your heater, you have plenty of great options. Check out this article: https://modestfish.com/best-aquarium-heaters/ They will all do a good job for you. This information was really helpful and accurate! I have owned and attempted to breed Bettas for a few years, but I am still learning. I have a couple of questions to ask, though. 1. How often should I monitor the pH,Ammonia , and Nitrate after the cycle? 2. Where do you recommend that I buy my Betta? Sorry, for the delayed response, I sometimes struggle to juggle the comments with my daily life and work. 1. Check everytime you do a water change. Easiest way to keep track. 2. Don’t fear too much about where you buy it (unless you want to breed, then try to get from a reputable breeder), more look for the qualities of a healthy Betta. So I’ve had my male betta from about a month now in my 10 gallon tank. My friend had a sorority in her 10 gallon tank but two days ago it broke and only two of her girls survived. She wants me to keep them and breed them with my male but i only have an old 3 gallon (i think) and i find it a very bad idea to have the two girls in that small of a tank so should i take my male from his 10 gallon and put him in the smaller one? Or will it be too bad for his health? Or should i put him in my breeder tank and the females in the 10 gal and let himmfloat around like that until my friend gets a new tank? Hello, thank you for your comment. Things could potentially get messy if you put the females with the males. If you’re just waiting for your friend to get a new tank, I would say putting your male in the 3 gallon (use water from his normal tank for his new tank to help,) and the females in the 10 gallon would be your best option. It might cause your male a little stress, but if it’s just temporary, you should be fine. Hello, I’m just starting out with the hobby, and I am about to get a new tank, fish, plants, etc.. With that in mind, would it be better to introduce the male betta first into the tank, or other tank mates such as neon tetras, ghost shrimp and snails? And is it possible to house both a male and female in the same tank if there is enough foliage, or tank space? Or is it purely based on luck if they fight or not? Cheers! I just purchased two male bettas from Petsmart. I have them in 2 different 3 gallon tanks. Unfortunately I wasn’t told to slowly introduce them into their new tanks. They came in small bowls and I put them straight into their new tanks after allowing the filter to run for 24 hours and the water clarifier to run through. The fish have not moved or come out since moving them into their new tanks. One sits up by the filter and the other sits inside his plant. It has been 24 hours since I moved them. Is this a sure sign that I stressed them too much? Should I assume they may die? Thank you for your comment, Heather. You’ve put them in a new environment, Bettas are sensitive fish, give them time and let them be for a bit. Hello! I’m currently planning on getting a betta fish for the first time and I have some questions. I don’t really have the space for a 5 gal tank so I was wondering if either a 3.5 or a 4 gal tank would be okay for a betta fish. And I’ve been researching that if you have a tank that’s less than 5 gallons, you shouldn’t have a filter because the current can be too strong for the betta. I know it’s hard to keep an unfiltered tank clean most of the time, but I was wondering if there was any way I could effectively keep the tank clean. Thank you!!! Hello, Ericka, thank you for your comment. When it comes to tank size, I tend to be a bit brutally honest with people. Let me put it this way, would you buy a dog and keep it in a small room, unable to provide the space needed for it to be happy and healthy, just so you can enjoy having a dog? I would guess and say no. It’s not your fault, so please don’t take it personally. People don’t value a fish’s life in the same way they value other animals lives because of how people are educated on pet fish. About the filter… wow, I’m shocked you’ve been advised this. You can easily get a sponge filter (low flow)or a HOB filter (again, low flow). Filter strength varies from filter to filter and there are tons of tricks you can do to lessen the water flow. If you don’t have a filter, how will you possibly keep a stable nitrogen cycle so you don’t risk poisoning for fish? Thank you so much for replying! And I appreciate honesty. 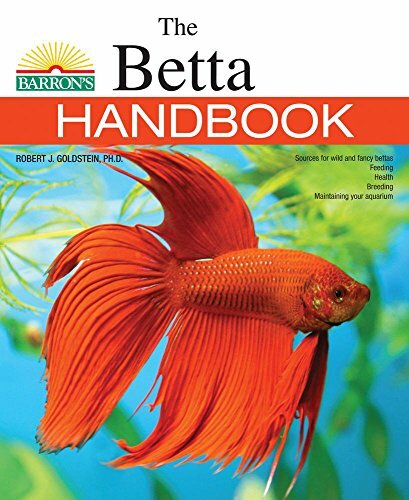 I really want to try to be a good betta fish owner, so I’m researching a lot. Would a taller 5 gal tank be sufficient? And as a beginner I’m not sure I know what a nitrogen cycle is. Not a lot of sites I visited mentioned it. What’s your estimate on how much a sponge filter is? No problem! I always try to reply as much as I can! A taller 5 gallon would be fine 🙂 and you can get all the information about the nitrogen cycle here: https://modestfish.com/how-to-cycle-your-aquarium/ Feel free to ask any more questions you may have and I promise I will reply as soon as I can. Sponge filters can be bought on Amazon for as little as $10/15. Even if you can’t afford top of the range, having some filtration is always better than none. Just wanted to say that I love your write up, it’s extremly helpful and informative. Thank you. My question is, when I’m setting up my tank, would it be wise to add aquarium salt? Right now I have an existing tank with a Betta that I’ve place an Indian almond leaf inside. I want to move him to another tank and I’m wondering whether it is okay to place both almond leaf and salt in his new tank? Thanks! I’ve had a betta since the end of July. First time I’ve ever owned a fish (my daughter wanted it). This fish always hides in the upper back corners of the tank. It rarely swims around when we’re in the room (although when we leave and then we come back, we’ll sometimes get a glimse of him swimming around, but when he sees us he goes back to the corner). He has a sponge bob house in his tank as well as some silk plants and one of those leafs he can lay on. But he never goes in or around those things (although one time we hid head first into one of his plants….weirdest thing I ever saw). Is all of this normal or is he just an odd fish? Thank you for your comment, Julie. 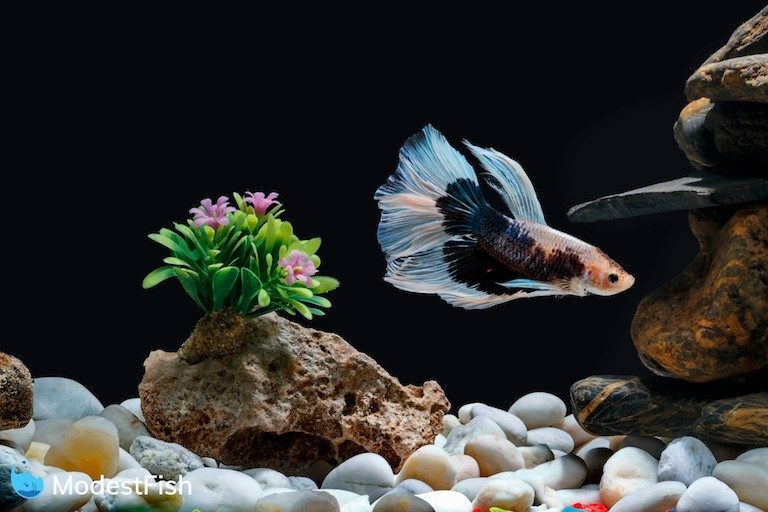 Sorry to hear your Betta is not particularly social, but it could be for a few reasons. One, it could still be adapting to its new home and may just be taking a while, and two, it might just be that your fish is a shy one. Bettas all have unique personalities so some will be more boisterous than others. Hi! So I just got my 2 bettas the day before yesterday, and I kept them in separate tanks. I followed the steps for introducing my bettas to the tanks. The female was eating the food I gave her, but it looks kind of pale and keeps going to the four edges and I don’t know what is happening. WHAT IS HAPPENING? Hello, Amy. Thank you for your comment. This could be a number of things, it’s hard for me to give you a concrete answer without knowing all of your water parameters, tank/equipment, and how you maintain your tank. Pale Bettas are usually a result of poor water quality, boredom, or being in small spaces. I recommend you test your water conditions and depending on the size and what’s in your tank, you may want to add more plants/decorations or upgrade the size. I have a betta that seems to have internal parasites. He’s in a 10 gallon heated, filtered tank with 7 khulis, some of whom may also he infected, so I have treated the tank with API General Cure. The treatment isn’t fully finished, yet the heater in the tank now seems completely non functional, and the water is cold! They’re already sick, so my heart is just breaking over this, but I don’t want to remove them mid-treatment and potentially hurt them, more. I have another heater I can use. Is there any way I can put the new heater in with them? It’s normal for me to run the heater 24 hours before adding fish! Thanks for explaining how a betta fish tank should be setup. It’s good to know that it’s important to have a tank that had decorations, like plants that provide shady areas. It sounds like it could be good to maybe have a bigger tank as well so more decorations can be placed for the fish to hide in.